Huronia Chapter - Ontario Archaeological Society: It is time to find Toanche. Some 5 years later now and the question has only become more urgent. 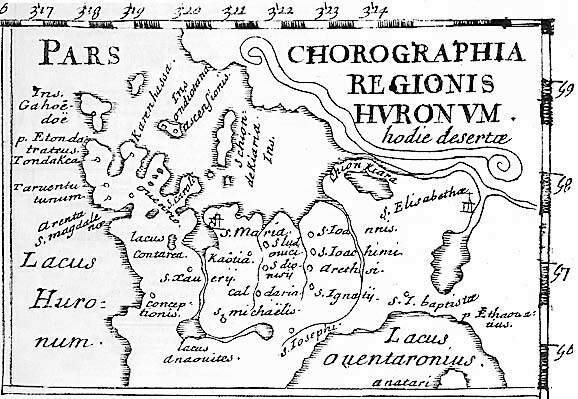 Toanche was the first Wendat village to be mentioned by Champlain shortly after his arrival in Huronia in August of 1615. It was the first village to welcome him and his entourage and where he stayed 2 nights before being given a tour of the Bear Nation’s homeland which was largely contained within what is now known as Tiny Township at the northern tip of Simcoe County. It is anticipated that in 2015 Huronia will host numerous celebrations and commemorations with events taking place in many of the communities of North Simcoe and beyond as was done for the 350 anniversary of Champlain’s arrival. Along with these events there is a desire among some groups to leave behind a lasting legacy to Champlain and the events that took place here. There is talk of a Champlain Huronia Centre. This centre is envisioned to provide a focal point to symbolize Champlain, Huronia and New France as vital components of Canada’s heritage. This is a huge undertaking and the group organizing this venture will be looking for a site to build this legacy to Champlain. As the Huronia Chapter’s president I have participated in discussions with this group and attempted to emphasize the importance of getting it right, telling the story of Champlain and his purpose for coming here and building whatever legacy project in place of historical significant. At times I feel that I am speaking to deaf ears as this group seems to be more driven by tourist interests than historical accuracy. Ironically, the ministry that funds tourism and the one that funds heritage interests, archaeology and museums is one and the same, The Ministry of Tourism and Culture and as the name might imply, tourism comes first. Tourism is seen as a positive cash flow while the rest are seen as negative cash flows so understandably heritage interest, archaeology and museums have a much harder time getting their fair share of the public purse. When called upon to give “expert” advice and attempt to persuade others to get it right this time I find the historical and archaeological community lacking in being able to prove its case. This is not because we lack the science or skill but sad is to say perhaps the interest is where we fall short. Each researcher wants to fall on their sword rather than work in a collaborative manner in the search after truth. This compounded with lack of sufficient funding means that we cannot effectively function in forums where “expert” advice can be given. Can we change this? Can we as historians and archaeologists put our collective heads and knowledge together and come up with conclusions that will represent answers based on the best that science can offer today or do we wish to go silent and have our communities continue to use 100 year old science when portraying our history and placing their monuments. So I will say again “Where is Toanche” – we need to find it before another 100 years goes by bookmarked by inaccuracies in archaeological identification or histories that are representative of fairytales. At least one researcher proposes that Champlain landed on the west coast of Tiny Twp not too far from Ossossane while another suggests Midland Bay but has yet to provide his argument for that thought. Does anyone else know of other site purported to be Toanche?